Greenwich Village usually conjures up visions of bearded, black-clad hipsters sipping coffee in jazz clubs, but it actually had a long history before the writers, revolutionaries and bohemians made it their enclave in the early 20th Century. The original Greenwich Village was a Canarsee Indian fishing village called Seppanikan (some accounts spell it Sapokanican), centered around a stream they called Manetta (which meant ‘devil water’. Later it became Minetta Brook; Minetta Street is located over the brook today). The site was later occupied by the Dutch, under whose governor Wouter Van Twiller, made it mainly a tobacco plantation. When Manhattan Island was taken over by the British, they called it Greenwich, possibly for the London suburb which is the starting point for the world’s longitude. When NYC adopted a rigid grid plan for its streets in 1811, Greenwich Village was allowed to maintain its rather confusing street pattern–largely because it had been isolated from the rest of the city by a yellow fever and cholera epidemic in the early 1800s! The street pattern of the Village is largely the same as it was in the late 1700s-early 1800s with crooked cart paths better suited for foot traffic than automobiles. Greenwich Street meanders to the northeast and northwest because it was originally the westernmost street and followed the Hudson riverbank. West of Greenwich, the streets are built on landfill. Two major changes occurred in the early 20th century, when the coming of the subway created two major street extensions. In 1917, Seventh Avenue was extended south from its original starting point at Greenwich Avenue to meet up with Varick Street at Clarkson Street. This change was due to the major subway construction of the west side IRT subway (today’s 1/2/3 lines). Similarly, later, in the late 20s, Sixth Avenue, which started at Carmine Street and Minetta Street, was extended south to Church Street in Soho because of the new IND line (today’s A/C/E trains). Both extensions created odd plazas and intersections…and eliminated some streets we’ll discuss here. LEFT: On this 1834 Greenwich Village map compiled by the New York City Fire Department, notice the terminals points of Sixth Avenue and Seventh Avenue (circled in gray). Oddly, Seventh Avenue kept its original house numbering scheme which started at Greenwich Avenue. The extension south from Greenwich Avenue was named Seventh Avenue South, and got its own house numbers. Sixth Avenue, however, was renumbered from its new southern point at Church and Franklin Streets. While the Village has not lost entire neighborhoods of streets as other areas of Manhattan have, that hasn’t meant that a large number of streets haven’t disappeared. Instead, they were ‘taken over’ by Sixth Avenue or simply renamed. To begin our Greenwich Village Necrology, let’s look at a trio of short streets that have been swallowed by Sixth Avenue. What’s there now? Still there! Take a look. A park separates this small street from Sixth avenue proper. The street carries 6th Ave/Avenue Of The Americas signs now. What’s there now? Swallowed by Sixth Avenue extension south in the late 1920s. Building alignment gives away the presence of a former street, though. It has also been called Cottage Place. 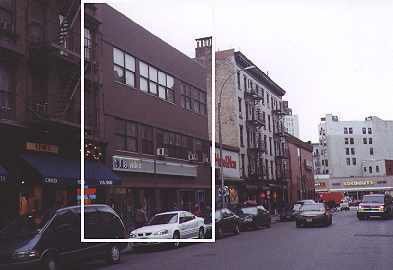 Location: Known as both Congress Street and Smith Street, this short street angled northeast between King Street and Hammersley (West Houston Street) west of MacDougal Street. 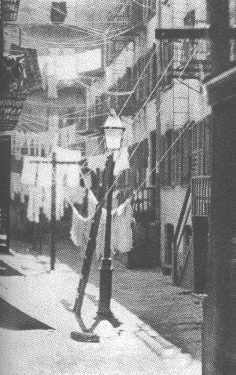 Short alleys named Congress Place and Smith Court were off the street in the 1800s. What’s there now? Eliminated by Sixth Avenue extension in late 1920s. though a trace can be seen in the building alignment. Most streets in Greenwich Village carry names, unlike the rest of the city to the north and east. But that wasn’t always the case. Here we’ll have a look at a few streets that now carry numbers where they used to have names. What’s there now? West 10th Street. This street was originally named for Richard Amos,who owned a parcel of land formerly belonging to the vast estate of Sir Peter Warren, which stretched from Christopher Street north to 21st Street west and north of what would become Washington Square Park. It is thought that Christopher and Charles Streets are named for Richard’s relative and trustee of the Warren Estate named Charles Christopher Amos. But the streets didn’t go in that order…from south to north, the names went: Christopher, Amos, Charles. Location: North side of Charles Street between Bleecker and West Fourth Street. What’s there now? In an unusual arrangement, the north side of Charles Street had a different name for a one-block stretch until 1936. It was renamed Charles Street to avoid confusion. What’s there now? West 11th Street. Originally named for Elijah Hammond, who owned a 55-acre estate there formerly belonging to Sir Peter Warren. One of Hammond’s houses still stands at 282 West 11th. Renamed 11th Street in the mid-1800s. What’s there now? Christopher Street. Originally named for Colonel Otis Skinner, who married Susanna Warren, daughter of landowner Sir Peter Warren. One of the first roads cut through the old Warren estate, this is a main street in the Village even today. Unsure why it was called Troy Street, but the change was made in the mid-1800s. Location: Between the Hudson River and Bedford Street/Hancock Street. Sixth Avenue was cut through after Hammersley Street was no longer there. What’s there now? West Houston Street. Hammersley became a western extension of West Houston in the mid-1800s. What’s there now? Bleecker Street, which extended only as far west as 6th Avenue until 1829, when the name was changed to Bleecker. What’s there now? Leroy Street. The name was changed in the late 1820s. What’s there now? Morton Street, which assumed Arden Street’s path in 1829. Arden Street had also been called Eden Street. Location: Between Greenwich Lane (Avenue) and Greenwich Street north of Bank Street. What’s there now? Bethune Street, name swicthed sometime in the 1820s. Location: This was once one of the main country roads of the west side of Manhattan before the overall street grid was adopted. As Southampton Road it extended from about where 8th Avenue and 21st Street would eventually be southwest to the Hudson River. The portion west of Greenwich Lane was named for a large kiln in the area, and eventually the spelling was corrupted to Great Kills Road. What’s there now? Gansevoort Street. The name change recalls a Revolutionary hero colonel. Location: Factory (West 4th) and Christopher Streets southwest to Hudson St at St. Lukes Church. It had previously been called Cozine St. and Columbia Street. William Burrows was a Naval hero in the War of 1812. What’s there now? Barrow Street. Because of the Raisin Street mispronunciation, it was decided to rename it in favor of artist Thomas Barrow. Location: L-shaped street between 7th Avenue South and Barrow Street. What’s there now: Commerce Street. When laid out in the 1820s, the short road was originally supposedly called Cherry Lane, but was quickly renamed Commerce Street. This explanation turns out to be mythical; the first owner of the Cherry Lane Theatre spread that rumor to drum up business. Nonetheless, a Cherry Lane street sign was installed in the early 2000s. Visitors and tourists often scratch their heads when having to deal with Greenwich Village’s strange street pattern. West 4th Street intersects West 10, 11 and 12 Streets. The reason for this is that West 4th angles to the northwest, while West 10, 11 and 12 Streets angle to the southwest. So, they eventually wind up meeting each other. Location:The path of West 4th Street between Sixth Avenue northwest to West 13th Street. What’s there now? West 4th Street. The asylum was demolished in 1833, and soon after, the street was renamed as West 4th Street. Only later were the other streets renamed West 10, 11 and 12 Sts. In all fairness, when you look at a map of the area, it looks quite logical that West 4th continue on its winding path northwest. Very few of the east-west numbered streets in Manhattan diverge from a straight east-west path, at least those south of the George Washington Bridge area. West 125th Street is another, angling northwest from Morningside Avenue west to Riverside Drive. What’s there now? When Factory Street became a western extension of Waverly Place in the mid-1800s, it created an unusual situation: Waverly Place now goes in two different directions, with one branch ending at Christopher Street and another continuing on northwest to Bank Street. In 1831, the Northern Dispensary was built to offer medical supplies to Villagers who were too poor to afford proper medical care. The building occupied the triangle formed by Factory, Waverly and Christopher streets. When Factory became Waverly, the Dispensary wound up with two walls on one street, and one side on two (Christopher and Grove). The Dispensary later became a dental clinic, and incredibly, lasted until 1989. What’s there now? West 3rd Street. Amity Street began its life as a country road called Amity Lane in the colonial era. Although the East Village has not seen quite as many street name changes since the mid-1800s as has the West Village, there are a number of alterations that have been made. What’s there now? Astor Place. Home to Cooper Union since 1859, Astor Place was once home to a country resort known as Vauxhall Gardens. 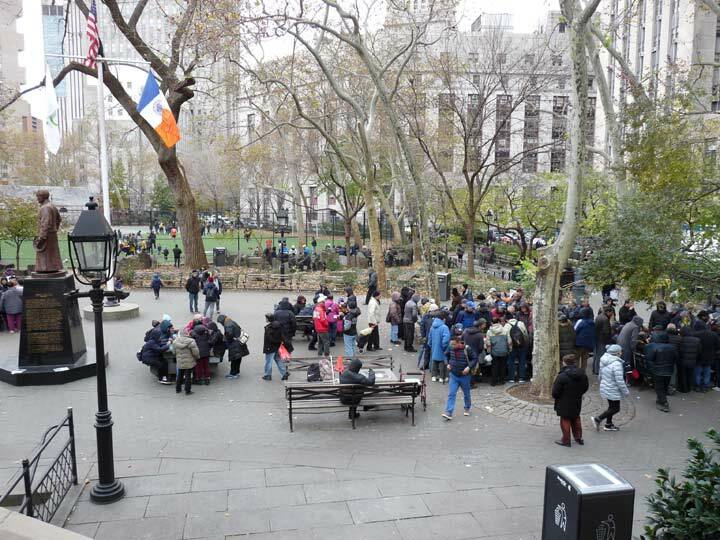 It was surrounded by a broad fence, with the main entrance near the center on the Bowery. Along the inside wall of the fence were a series of boxes or dining booths with tables, at which light refreshments were served. The garden was embellished with walks, trees, flowers, shrubs, etc., and in the center was a large building in which theatrical performances were given, with interludes of songs and dances. An equestrian statue of George Washington, which may have been the wooden statue originally erected in Bowling Green stood in the garden. What’s there now? Lafayette Street. The current path of Lafayette Street was occupied by Lafayette Place, home to one of the great architectural treasures of the Village, Colonnade Row, and Elm Street. In 1900, Lafayette Place and Elm Street were merged to create a through route between the Brooklyn Bridge and the East Village; Marion Street’s path was eliminated by the new Lafayette Street. Location: Short street between East 6th and East 7th Streets east of Cooper Square. What’s there now? Taras Shevchenko Place. Renamed in 1978 for the 19th-Century Ukrainian writer, artist and political activist. A recently installed street sign (2010) adds Hall Place again. What’s there now? A piece of Dry Dock Street survives as Szold Place, renamed for Henrietta Szold, founder of Hadassah, the women’s Zionist organization. There really was a dry dock at about East 10th and the East River in the 1800s, and the name survived in the Dry Dock Savings Bank well into the 1900s. Unremembered by most, except for aficionados of lost streets like your webmaster, West 8th Street used to be known as Clinton Place in the 1800s (just as it is known as St. Marks Place east of Third Avenue). There also was an alley called Clinton Court at about 52 West 8th. The building boxed in white (above) is in the spot formerly occupied by the court. Named for a twisting brook that still runs under NYC streets, Minetta Street and Minetta Lane are presently in the heart of the Village. 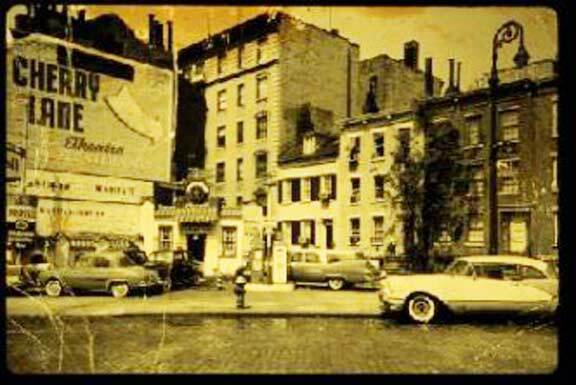 Until the early 20th Century, there were two other “Minettas”, Minetta Place (left) and Minetta Court. 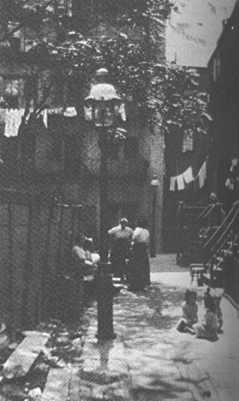 The “Minettas” were home to one of NYC’s most dangerous ghettos in the late 1800s. These were four private streets that were a part of the Gansevoort Market in the late 1800s-early 1900s. The Market was at about where West and Gansevoort Streets meet today, alongside the Hudson River. Two roads that would have greatly altered the traffic patterns in the Village were never built because of local opposition. Here’s the story behind two Village roads that never were. Verrazano Street, which was never built, is shown on this 1967 map of Greenwich Village. Location: Would have been between Sixth Avenue and Houston Street and 7th Avenue South and St. Lukes Place. Verrazano Street would have connected busy West Houston Street to the proposed Lower Manhattan Expressway, a superhighway that would have connected the Holland Tunnel to Williamsburg and Manhattan Bridges. The project actually got under way in 1962 when the city began buying property and condemning buildings along the proposed route. But community opposition gained momentum and support and the Lower Manhattan Expressway became one of the rare projects that Robert Moses couldn’t get underway. For detailed information on the “LoMax” see Steve Anderson’s NYC Roads page. Location: Along the Hudson River from the Battery to 42nd Street in an underground tunnel. What’s there now? West Street and 12th Avenue, same as before, though reconstruction is in progress. Westway would have been a six-lane superhighway with the roadway contained in a tunnel and a park built above it. The project was first introduced in 1972 and had the support of Mayors Lindsay and Beame, Governor Carey and business and labor leaders, but was vehemently opposed by environmental groups such as the New York Clean Air Campaign. After a series of court hearings that mostly removed state and federal funding for Westway, the project was formally canceled in 1990. In the late 1990s, a scaled-down project that kept the roadway at grade but built new parks and bicycle paths along the Hudson was under way. The new roadway would bear the name Joe DiMaggio Parkway after the late Yankee great. The Lower Manhattan Expressway, which would have cut a swath through Tribeca from the Holland Tunnel to the Williamsburgh Bridge, is shown on this 1967 map from the orginal AIA Guide to New York City in 1967. A spur at the Bowery would have connected it to the Manhattan Bridge. ONE-WAY EVOLUTION. One-way signs through the years.